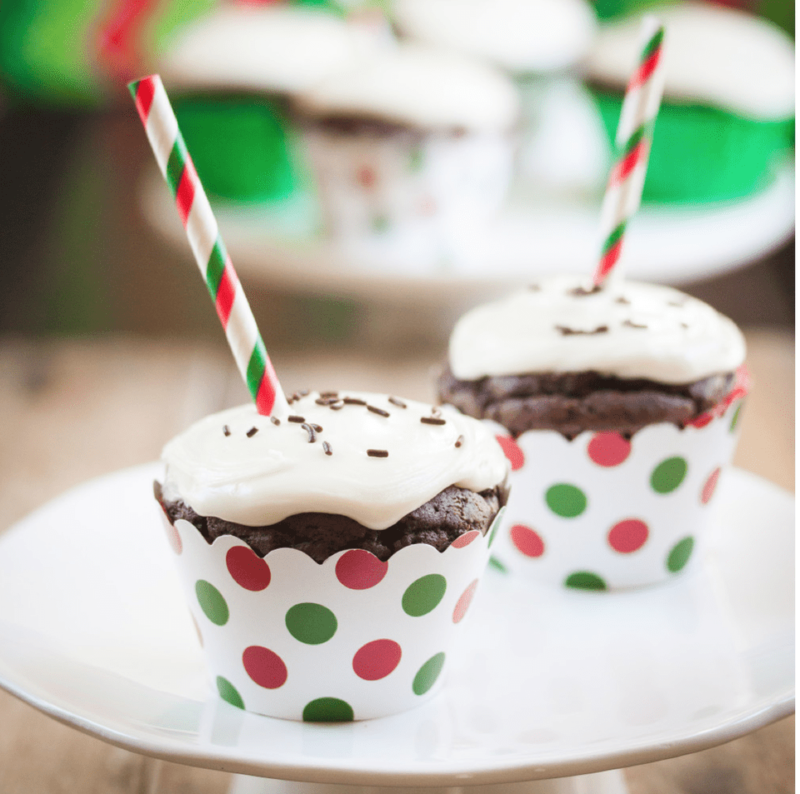 These fun treats taste just like a mug of hot cocoa laced with peppermint candy canes. If you're not fond of peppermint flavor, simply use 1/4 teaspoon more vanilla extract or almond extract instead. The frosting is made with vegan marshmallows--which you can find online or at various Natural Foods Stores, such as Whole Foods--so they really taste quite a bit like a piping cup of hot cocoa. This recipe includes chickpea flour, as it is used not only as a flour, but also an egg-replacer/binder as well. For those of you who raise an eyebrow at the inclusion of buckwheat, rest assured–you can’t taste it even a little bit in these cakes. It does, however, add a warm depth to the chocolaty flavor that should not be missed. If you can't locate buckwheat flour, or simply don't have any on hand, feel free to sub in 1/2 cup additional all purpose flour in its place. Preheat your oven to 350 ºF and line 12 cupcakes tins with paper liners. In a large bowl, combine all the ingredients up to the olive oil and whisk well to mix. Make a well in the center and add in the olive oil, vanilla extract, peppermint extract if using, and nondairy milk. Mix very well until the batter is smooth. Divide evenly among the 12 tins and bake for 26 minutes in your preheated oven, or until a toothpick inserted into the center comes out clean. In a small saucepan, melt the marshmallows and the margarine over medium low heat, stirring constantly until smooth. Place the mixture into the bowl of an electric mixer and add in the nondairy milk. Add the confectioner’s sugar, a little at a time and mix on high speed until fluffy. Frost cooled cupcakes and then place into the refrigerator to firm up before serving. Store in an airtight container up to 4 days.